careful prescribing of antibiotics to abate the development of resistance. the addition of a new combination product. What is acne and who does it affect? An understanding of the fundamental mechanisms involved in development of acne lesions is helpful in choosing the best treatment. The pilosebaceous unit from which the acne lesions derive can exhibit varying sensitivities in different parts of the acne-prone areas, resulting in, for example, one patient affected on the face but not the chest or back, and vice versa. It is important to check all areas, as some patients may not volunteer the full extent of their problem. Indicators that require prompt referral, known as red flags, are shown in the algorithm below. Psychological disturbance, which often manifests as withdrawal from social interaction and depression, is a significant and crucial aspect of the disease for which GPs need to be alert. Indeed, the objective severity of the acne lesions may not correlate with the risk of depression, suicidal ideation, or even suicidal action.5 A quality of life index such as the universal Dermatology Life Quality Index (DLQI)6 can be very helpful and is easy to use to determine the full impact of the disease on a patient. Other urgent considerations are: nodulocystic acne, uncontrolled acne that is leading to scarring, diagnostic uncertainty, and failure to respond to multiple therapeutic interventions. Grading systems can be used to record the type and severity of acne (e.g. the one described by James W7) but a general assessment such as mild, moderate, or severe, along with a description such as comedonal, papulo-pustular, or nodular and a record of the areas affected, will be adequate. The patient’s own smartphone is ideal for recording photographs before, during, and after treatment, as it obviates issues around confidentiality and can reveal progress in symptom improvement that may be denied by an impatient patient. Early treatment for acne is important not only to alleviate the short-term soreness and distress due to the appearance of the acne, but also to prevent long-term consequences of scarring, as treatments that are designed to reduce scarring are unimpressive at best. Prevention is much better than cure. Once the type of lesion present has been determined, principles to consider include the likelihood of compliance (once-daily dosing being the ideal); speed of onset and effectiveness of the treatment; the risk of side-effects such as soreness, dryness, and redness from topical therapies; and the risk of developing resistance if antibiotics are to be used. Topical retinoids are at last beginning to gain a foothold in the armamentarium of GPs and other prescribing clinicians despite these drugs having been the most important first-line option according to expert opinion for all types and grades of acne for many years (except where oral retinoid therapy with isotretinoin becomes necessary).9 Perhaps the fact that the topical preparations share the name 'retinoid' has limited the use of topical retinoid therapy. Retinoids prevent the formation of microcomedones and thus the ongoing development of comedones to papules, pustules, and even nodules; in comparison, other treatments do not fundamentally affect the acne disease process. The poor uptake of topical retinoid therapy is perhaps because of the association with oral retinoids and their teratogenic risks. Both isotretinoin10,11 (1 month) and the retinoids used in psoriasis, e.g. acetretin12,13 (2 years), are teratogenic and so their use requires female patients to avoid pregnancy for the periods indicated. Although topical retinoids should not be used in pregnancy, there is no need to do anything other than stop adapalene, for example, should any woman fall pregnant while using it. 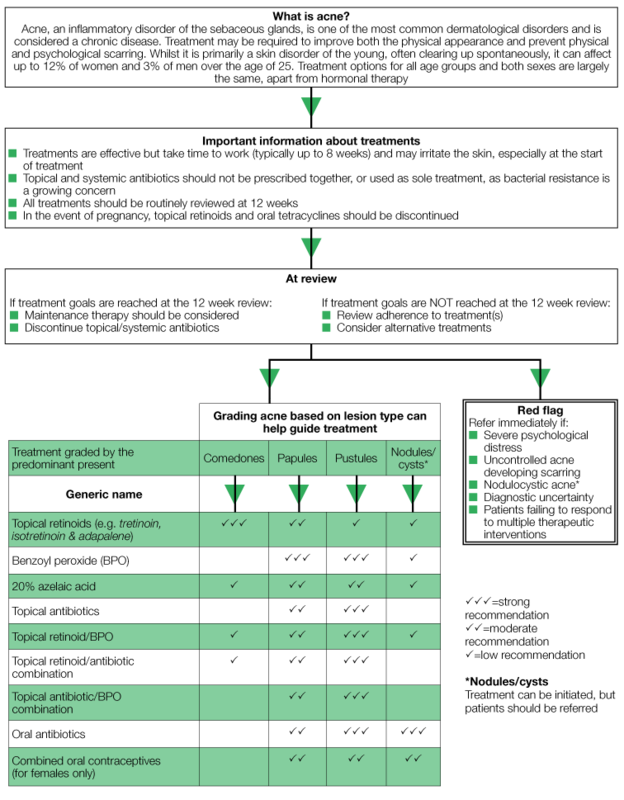 The acne algorithm produced by PCDS (see Figure 1, below) lists the choices available to clinicians; however, perhaps the most important benefit—as is so often the case—is the drug 'doctor', i.e empathy that is engendered by the serious and caring approach taken by a clinician when explaining and anticipating difficulties with any treatment choice. Following up on the patient’s progress is often as important as the drug itself. When starting irritant topicals such as benzoyl peroxide (BPO), retinoids such as adapalene or tretinoin, and their combinations, it is important to do so very slowly—for example, by initially leaving them on the face for 20–30 minutes and then leaving them on for longer periods before trying them overnight, and then only every two or three nights before achieving a regular overnight regimen, perhaps after a fortnight or so. It is difficult to be precise, as every patient is unique and has to be helped through the first stages if appropriate compliance is to be achieved. Advising or prescribing a noncomedogenic light emollient can be a great help to counteract any dryness or soreness and is much better started initially than waiting for the problem to arise before attempting to treat it. PCDS. Acne—primary care treatment pathway. PCDS, 2015. If the lesions are very severe or widespread, oral antibiotics may be necessary,14 which, again, should ideally be taken once daily to aid compliance, but they must always be used in combination with a topical retinoid or BPO. Lymecycline or doxycycline are preferred as they are better absorbed than other tetracyclines. Erythromycin can be used by women with possible or actual pregnancy, although resistance among Propionebacterium acne is high.4 Whether antibiotics are taken orally or topically, a 1- or 2-week break from antibiotic therapy after a few months is advisable, reverting to the use of a topical antimicrobial such as BPO, as this helps to eliminate resistant strains. A switch to a non-antibiotic topical therapy with or including a retinoid in combination should be considered as soon as possible—for example, when acute inflammation has subsided. Hormone therapy with co-cyprindiol or another second- or third-generation combined oral contraceptive in females can be beneficial, with the usual concerns of a mild increase in the risk of breast cancer and, with co-cyprindiol, a small increase in the risk of deep vein thrombosis in the early weeks of treatment. Conversely, progesterone-only oral contraceptives and long-acting progesterone implants can aggravate acne and may be best changed or withdrawn if they are seen to do so. Acne should be treated early and aggressively, aiming to resolve existing lesions, prevent scarring, and suppress the development of new clinical lesions. Combination therapy has become the recommended firstline approach in most cases. Topical retinoids are an important ingredient in any treatment regimen for acne and should be used as monotherapy for purely comedonal types. Early referral to secondary care (or a collaborative clinic involving a GP with a special interest) for oral isotretinoin should be made if any red flags are present or developing (see Figure 1, above), but aggressive topical therapy in addition to an oral antibiotic should be started while waiting for the appointment. More detailed advice about the management of the different types of acne, including the rarer types, is covered in more detail and with explanatory photographs on the PCDS website. Arrange follow-up appointments with the patient and give realistic expectations (e.g. an 80% improvement in 8 months). Nast A, Dreno B, Bettoli V et al. European evidence-based (S3) guidelines for the treatment of acne. J Euro Acad Dermatol Venereol 2012; 26: 1–29. Fabri A, Folador B, Vilaverde Schmitt J. Persistence of acne beyond 21 year of age in adolescent female patients: a retrospective cohort.J Clin Exp Dermatol Res. 2011; 2 (3): 1000122. Williams H, Dellavalle R, Garner S. Acne vulgaris. Lancet 2012; 379 (9813): 361–372. Halvorsen J, Stern R, Dalgard F et al. Suicidal ideation, mental health problems, and social impairment are increased in adolescents with acne: a population-based study. J Invest Dermatol 2011; 131 (2): 363–370. Quality of life questionnaires. Dermatology Quality of Life Index. Available at: www.cardiff.ac.uk/dermatology/quality-of-life/ (accessed 5 February 2016). James W. Clinical practice. Acne. Engl J Med 2005; 352 (14): 1463–1472. Drug and Therapeutics Bulletin. What role for topical antibacterials in acne? DTB 2010; 48: 141–144. Thiboutot D, Gollnick H, Bettoli V. New insights into the management of acne: an update from the Global Alliance to Improve Outcomes in Acne group. J Am Acad Dermatol 2009; 60 (Suppl 5): S1–50.